Presented at West Village Theatre, Soulocentric’s Dance Cabaret is a showcase of original works by both emerging and professional dancers. The Dance Cabaret runs as part of the company’s 2015 Contemporary Performance Showcase, formerly known as the Soulocentric Dance Festival. Ranging in style and tone, the Dance Cabaret comprises of eleven works choreographed and performed by local and national dancers. The showcase opens with Tangy Lime Dance Projects’ baBBLe ON, a contemporary stilt dance piece. Stilt dancer Allara Gooliaf impresses with the control and ease of effort she displays moving to the sounds of a bustling city. The urban soundscape mixed with Julie Funk’s active movement is reminiscent of the 1998 film Run Lola Run. The piece runs smoothly until Tara Blue, who is also on stilts, starts singing. The loud music overpowers the dancer who simply cannot compete, thus making the audience lost on the lyrics. As a result, the piece ends on a weak note. Next, Kelsey Hanna and Megan Fraser take the stage for their contemporary piece From Silence. Hanna and Fraser, both professional graduate students from the School of Alberta Ballet, are a tight pairing in this piece that explores the difficulty of loving that which cause one pain. Dario Charles’ solo piece Without Face follows. Charles confidently exposes and plays with the the impact social conventions have on our capacity for real, unmediated human interactions. One way Charles does this is by creating uneasiness through inactivity. Sitting down, adjusting himself for maximum comfort, Charles takes a stand against the expectations of the audience – performer relationship. Then, through repeated motions, the dancer emphasizes the scripted nature of our relationships with the other. Overall, Charles presents an interesting piece. (Although, at one point, Charles’ own script refers to non-existent armrests which does remove us from the narrative). Natalka Lewis and her company Trip The Light Dance present Dandelion Children. 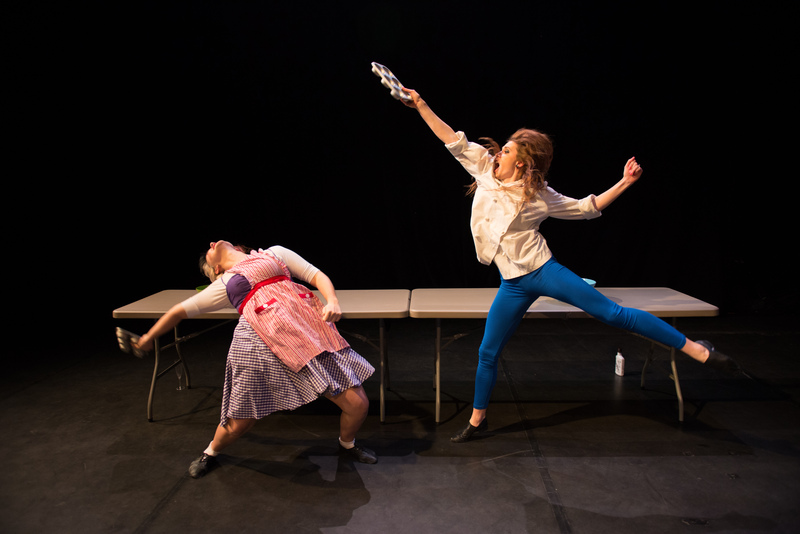 A collaborative effort between Lewis and her seven dancers (Misha Behnia, Madison Dixon, Odessa Johnston, Christina Robertson, Janelle Shiffner, Jordan Wallan & Katherine Mandolidis), Dandelion Children stages the abusive relationship between a mother and her daughter. The ensemble reflects the complexity of these relationships in a recurring phrase of movement where one dancer supports the other, only to drop her suddenly onto the floor. And then, they switch positions; the abuser becomes the abused. The choreography is well-thought out, and clearly presents the narrative it sets out to tell. Although, the choreography does lack an exact moment where the daughter, played by Lewis, comes into her own, leaving something to be desired in terms of a cohesive resolution. Halifax-based dance company Votive Dance tells its own narrative of control in Proven Lands (choreography by Catherine Hayward). Kathleen Doherty plays a sinister character/force that sets out to corrupt and manipulate Stephanie Mitro’s character who attempts to resist her influence. Doherty embodies very well the weight of conformity on the individual, and Mitro displays a great vulnerability in the piece. The piece does lose some steam near its end, which is drawn out quite slowly, but overall it is a solid piece from start to finish. Der schuh-shoe-La chaussure, choreographed by Jason Owin Galeos, is the last piece before intermission. Interested in the shoes we wear and where they take us in life, the piece begins with four dancers – Galeos, Cenzia Nina Aviles, Meghann Michalsky, and Chandler Smith – who walk on stage holding in their arms various footwear. The piece fails to make its intentions clear, thus making it feel like a missed opportunity. Galeos’s choreography attempts to grasp onto a central idea, but leaves the audience with little going into intermission. Taking us into the second act is Metamorphsis, choreographed and performed by Krizia Canvas Carlos and Aris Nsungani. Carlos and Nsungani light up the stage in this exciting urban dance fusion piece. Choreographed by Naomi Lawson Baird, Jass Parlour’s Daughters of The Deep is a short jazz piece that features Baird, Kimberley Ilott, and Hannah McCathy. Well-executed, though not particularly memorable. Performed by Terra Plum, Jessalyn Britton, and Janelle Schiffer, Tri Some blends jazz with West African dance forms. Plum’s upbeat choreography is delivered effortlessly by the dancers. The mix between the two dance styles makes for a very cool piece. Carisa Hendrix brings a strong stage presence in Just For Me, a solo hula hoop act created by Hendrix. What makes this short, playful piece particularly entertaining is both the speed at which Hendrix maneuvers her hula hoop and the element of risk (e.g. the hoop hitting the floor, bringing the piece to a sudden stop) in the maneuvers she performs. Shelby Jansen and Allison Zwozdesky bring the night to a close with Cooking Truths. In Cooking Truths, Jansen and Zwozdesky play two celebrity chefs competing against each other in the kitchen. There is an array of fun, bizarre moments, like Jansen plucking her rival’s heart out, that receive big laughs from the audience. And inventive staging keeps the piece moving forward as the dancers flip and fold tables to create big, epic moments of warfare (performed in slow motion, of course). The piece does take time to hit its stride, however, as its first couple minutes are rather clunky and awkward. Moreover, the piece might benefit from a shorter run time as it feels a little too loose in its current state. Featuring a diverse range of original works, Soulocentric’s Dance Cabaret succeeds at entertaining, and giving audience members the opportunity to witness and support Canada’s independent artists. Soulocentric’s Contemporary Performance Showcase ran at West Village Theatre, Feb 19-21 2015.